Following on from my blog post in December, ‘Will Kate be choosing traditional white wedding flowers?’, I’ve been trying to guess what style of bridal bouquet she’ll have. Currently the most popular bridal bouquet design is the hand-tied bouquet. It’s a bunch of flowers and sometimes foliage, which are arranged so that their stems are spiralled, as shown below. I think however that Kate may have a shower bouquet, which is also known as a cascade/cascading bouquet. It’s one of the most traditional styles of bridal bouquet and features a flowing arrangement of flowers which appear to ‘cascade’ from the bride’s hands. The flowers and foliage are usually individually wired, which helps to reduce the overall weight of the bouquet and it also means that shorter flowers can be included, as they are lengthened with the wire. This type of design was very fashionable before the hand-tied bouquet was introduced and was made popular by the royal weddings of Princess Diana and Sarah Ferguson. An example of a shower bouquet is shown below. 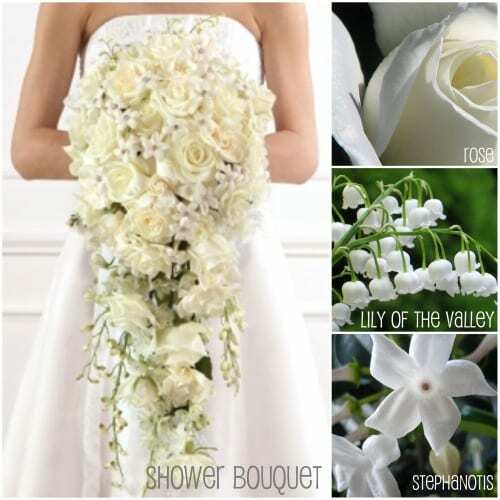 Perhaps Kate’s bouquet will include roses, lily of the valley and stephanotis? The beautifully scented and delicate lily of the valley has a very short season. It’s usually only available in April and May, so their wedding day at the end of April is perfect! 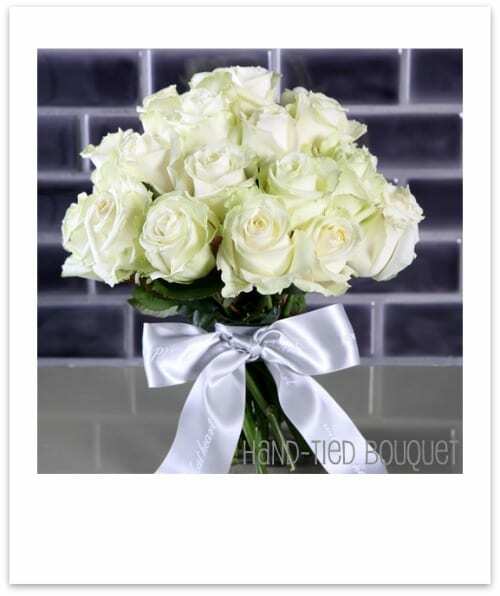 Roses are a very traditional wedding flower and stephanotis would also add a lovely fragrance. Recently, it’s been announced that after the wedding ceremony, Kate will follow the Queen and Princess Diana by having her bridal bouquet placed on the Unknown Warrior’s tomb at Westminster Abbey – a tradition that began in 1923 with Queen Elizabeth, the Queen Mother, following her marriage to King George VI. 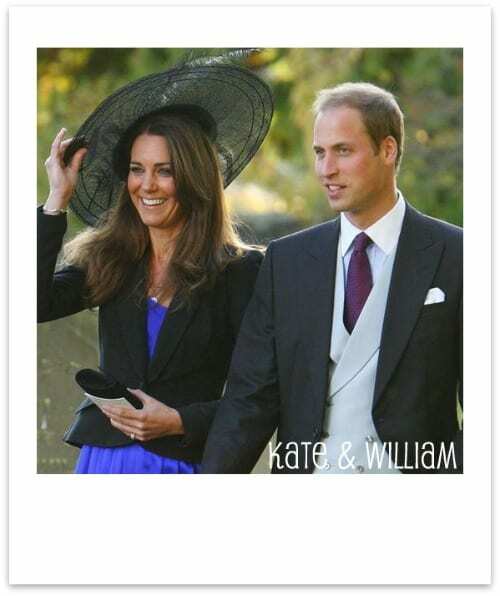 We’ll all have to wait until April 29th to see what Kate’s bridal bouquet looks like. It will be the most photographed floral arrangement on the day…and I can’t wait to see it! I agree a formal shower wired style for a very formal occasion, so fed up with the bunches, unless they are held well all you get are hands and stems in the pictures. A big church and a big space requires a big design, your picture would be perfect and expensive. The Prykes and Packers have been trying to head a revival of the wired shower for years and sadly very few florists have the skills now they have all got lazy jast suggesting bunches with ribbon bandages to finish off. As an old Spry Girl I say its time for some glamour. Hi Sue. Many thanks for your comment. Wiring is such a skill, isn’t it…and I LOVE doing it, even though it can be a bit fiddly! Looks like we’ll both be glued to the television when Kate steps out of her car at the end of next month. I love the bouquets and arrangements on your website! Does the Constance Spry Flower School still exist? Kate is very contemporary in her style. The latest trends for 2011 and 2012 wedding flowers is for the bride to carry colour and no more of the bunched hand-ties. I think she will carry some colour, perhaps yellow, green and white with soft pink styled in a holder as a crescent cascade. Flowers would consist of David Austin roses, calla lilies are too dated so lovely nerines would be nice. White casa blanca lilies, freesia and dendrobium orchids with minimal greens only a few grasses and of course the mertle. Fragrant, classy and strong!